Gridlock grounds activities in Lagos. The Lagos Waste Management Authority (LAWMA) has said the traffic gridlock along Apapa-Shodi Expressway is hampering the removal of waste by its personnel in Apapa area of Lagos State. The Head, Public Affairs, LAWMA, Mr Obinna Onyenali, disclosed this in a statement in Lagos on Thursday. 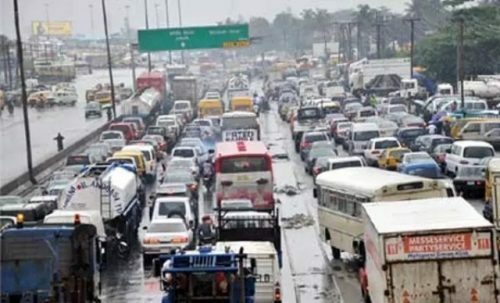 He said the gridlock, often caused by articulated vehicles and trucks had caused the collapse of public hygiene and waste management in Apapa. He said almost all the roads in the area had become inaccessible by LAWMA’s operational vehicles. ”This deplorable condition of the environment at Apapa and the continuous degeneration of quality of life has become a source of worry for LAWMA. ”LAWMA in recent times has intensified efforts to rid the state of backlog of wastes which have defaced the environment. ”We have deployed trucks across the state to stem the tide of indiscriminate dumping of refuse. ”We have also engaged the PSP operators to tackle wastes at household level. ”However, all efforts by the authority to extend its services to Apapa are being hampered by the heavy presence of articulated trucks. ”These trucks have blocked everywhere and made the roads impassable for LAWMA and PSP operators,” he said. Onyeali said that the situation had affected the operations of LAWMA sweepers, who according to him could not work efficiently.